Tandem Skydive -vs- Accelerated Student Skydiving? One of the most commonly asked questions that we get is “What is the difference between a Tandem skydive or Acclereated Freefall Student program for my first jump”. My answer to that question is that it depends on YOU! We offer both to first time skydivers and we will spend time in this post to talk about both methods. The two programs skydive from the same on altitude and all of our skydives at Oklahoma Skydiving Center are from 14,000 feet! So the amount of freefall for the Accelerated Freefall Student and the Tandem Skydive is almost exactly the same amount of time a minute or more! With both of the programs you will learn how to exit, freefall, and fly the parachute. We do offer the ultimate experience of 18,000 foot tandem skydive for an extra charge. NO ONE else in our region will take you as high as Oklahoma Skydiving Center! 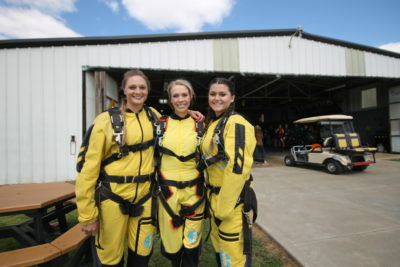 Skydiving is all about the experience, so why not go with the BEST! Tandem Skydiving only requires a short briefing / training due to the fact that you will be harnessed to the parachute system along with your instructor. Yes, we are connected! There are 4 connections with over 15,000 pounds of buckles holding us together. With a Tandem skydive you can plan on being here from 1.5-2 hours start to finish including training, gearing up, and making your skydive. Our tandem instructors are all certified by the United States Parachute Association and have 1,000’s of skydives and some have as many as 12,000 skydives! We are picky with our instructors to make sure you receive the best possible experience and have the most fun with the best instructors in the sport! You can click here to meet our staff! 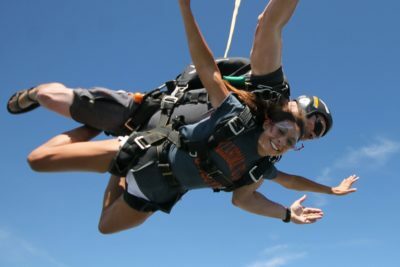 Accelerated Freefall Student starts with our fist jump class that we offer on Saturdays starting at 9am. You can expect a full day of learning and fun. Skydiving is a facinating sport and this is an introduction to whole new world. Be prepared to be here all day, with student skydiving the wind and cloud conditions are much more critical so some times we wait until the very end of the day for the first just students to make their skydives. This first jump is an introduction in to the student program that consists of 7 levels. Once a jumper finishes the 7 student skydives they are cleared for self supervised freefall so they can continue to work on their USPA “A” License which they can test for at 25 jumps!